A US-based organisation that campaigns for LGBT sportspeople has cut its links with tennis legend Martina Navratilova over comments she made about male-to-female transgender athletes. The 18-time Grand Slam champion wrote it was "cheating" to allow transgender women to compete in women's sport as they had unfair physical advantages. Athlete Ally said the remarks were transphobic and perpetuated myths. It said it had sacked the star from its advisory board and as an ambassador. In an article for the British newspaper The Sunday Times, Navratilova wrote: "A man can decide to be female, take hormones if required by whatever sporting organisation is concerned, win everything in sight and perhaps earn a small fortune, and then reverse his decision and go back to making babies if he so desires." She added: "It's insane and it's cheating. I am happy to address a transgender woman in whatever form she prefers, but I would not be happy to compete against her. It would not be fair." How do trans people decide their name? Trans sportswomen quickly hit back. Rachel McKinnon, who last year became the first transgender woman to win a world track cycling title, called the comments "disturbing, upsetting and deeply transphobic". In its statement, Athlete Ally said Navratilova's comments were "transphobic, based on a false understanding of science and data, and perpetuate dangerous myths that lead to the ongoing targeting of trans people through discriminatory laws, hateful stereotypes and disproportionate violence". It added: "This is not the first time we have approached Martina on this topic. In late December, she made deeply troubling comments across her social media channels about the ability for trans athletes to compete in sport. We reached out directly offering to be a resource as she sought further education, and we never heard back." Athlete Ally said Navratilova joined as an ambassador and was honoured with an Action Award at the group's first annual gala in 2014. She has since taken part in advocacy campaigns including signing an open letter calling on the International Basketball Federation (Fiba) to overturn its ban on the hijab and an open letter speaking out against an anti-trans bill in Texas in 2017. The group said the former champion had not yet responded to its decision to drop her. 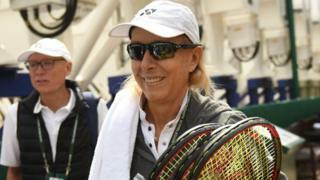 Navratilova has been a longstanding campaigner for gay rights and suffered abuse when she came out as gay in the 1980s. Under guidelines introduced in 2016, the International Olympic Committee (IOC) allows athletes transitioning from female to male to participate without restrictions. Male to female competitors, however, are required to have kept their levels of testosterone - a hormone that increases muscle mass - below a certain level for at least 12 months.